Boston is becoming a lot more bike-friendly. Newly minted bike lanes are popping up around town, and each day they are filled with more cyclists commuting to work. This summer, bike-sharing service Hubway celebrated two years and one million rides. While officials work to make Boston safer and easier for bikes, Kathryn Carlson is improving the personal biking experience and hoping to encourage more people to travel via two wheels. Her Buca Boot is a weatherproof, lockable storage bin that mounts to any bike rack, effectively acting like the trunk of a car. We talked with Carlson, an economist by trade, about her Kickstarter campaign, where she got this idea, and just how she manages to bike year-round. 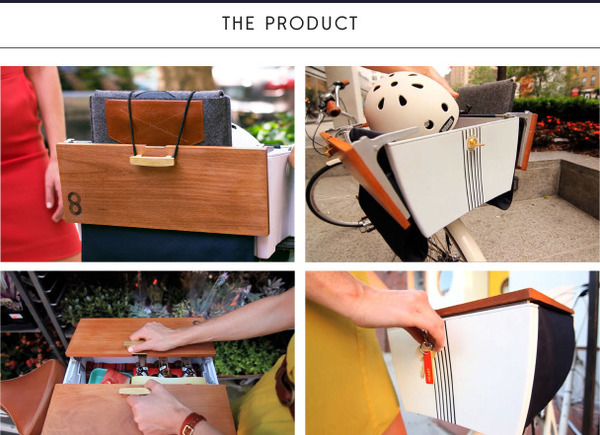 Buca Boot seems like the storage solution cyclists have been waiting for. How did you come up with the idea? Yes! I think it is and mainly because it is the solution that I've been waiting for. It was really born out of my practical experiences and I started designing it to fill a void I found in my daily cycling experience. I use my bike like a car, it takes me to and from work and all activities in between. But it can be tough to deal with the what-ifs. What if it rains later? I don't want to have to carry a raincoat around all day. What if I want to meet friends after work for dinner? I don't want to carry my helmet and extra work stuff into the restaurant. The first spark came while going to grad school in London. I went out to meet friends for the evening and, really, it came down to shoes. I wanted to wear something practical for biking across London, but they didn't work for dancing at the club. 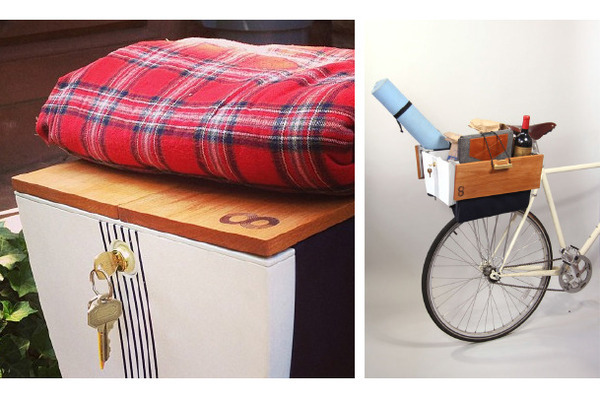 I realized I wanted a car trunk for my bike — somewhere that I could throw my things and walk away. Mostly, I didn't want to feel like a pack mule on my bike. I wanted to make it easier and more convenient to choose my bike. And if I could do it, I thought it would help others, too. I saw your Kickstarter and thought, "This is awesome! Why didn't it already exist?" Do you know of anyone trying to create something similar in the past? I was as shocked as you were when I realized nothing like this existed. Part of the problem is that the urban everyday biking community is relatively new, at least in the U.S. Obviously there have been subcultures blazing this trail for a while, but the mainstreaming of bike commuting is an ongoing process. Bike lanes are still being added to cities, bike share programs are getting people acclimated to riding in urban environments, and I am trying to bring a sense of style to a sector that hasn't always melded form with function. It sometimes seems as if all bike accessories are made for men who live in Boulder by men who live in Boulder. So I set out to create a beautiful, functional design that appealed to people who live in Boston, Boulder or the Bay Area. You're an economist by trade. Do you have a DIY/maker past, or is this your first foray into that space? First foray! That's probably why its taken me so long to go from the initial concept to a prototype. Luckily, I do have a lot of friends and supporters who are involved in engineering and start-up circles. Their advice and support made me realize I could make this a real product. And a few gave me a big push to make sure I would do more than just dream about the Buca Boot. Still, it has taken five years of working with various engineers and designers to get both the form and functionality I desired. What have been the challenges you've faced? Time. In addition to developing Buca Boot, I work a full-time job, serve on the Board of LivableStreets, and try to make time for passions such as sailing and playing the fiddle. Has biking in Boston influenced your design? Boston is a great city for biking. It's relatively compact and because of the road layout its usually quicker to bike somewhere than to drive. So Boston is a big part of why I've moved my life onto my bicycle — now I just need a Buca Boot to make it even more convenient! Will Buca Boot really stand up to New England weather? Also, how on Earth do you bike all year in Boston?! Absolutely! The plastic base and nylon panniers were specially selected to withstand the elements. The last piece of the puzzle is the lid. We're testing a variety of materials right now, from specially treated bamboo to marine-grade mahogany to various plastics. Several look promising, it's just a matter of picking the one that has the right combination of price, sturdiness, and style. Not to mention I'm from Wisconsin. Harsh winters are in my blood! We have a saying that there's no bad weather, just inappropriate clothing. Winter means down coat, warm mittens, and sometimes a fleece face mask, which is a godsend against wind. Plus, if you have the right gear for extremities, you actually stay incredibly warm biking in the winter — you're keeping your blood moving! Do you think that Buca Boot will inspire more people to use bikes for commuting? That's the idea. The Buca Boot is designed to make it easier and more convenient to use your bike. There are already huge advantages to bike commuting. What holds a lot of people back is simply feeling uncomfortable with city biking and unwilling to give the convenience of a car. The introduction of Hubway and installation of new bike lanes are getting people more comfortable with biking in the city. Buca Boot is the last piece of the puzzle. It gives bikes the storage, security, and flexibility of other transit options. Have any other favorite bike accessories you'd like to share? I'm eagerly awaiting my set of Fortified bike lights (another Cambridge Kickstarter success story). But for now, my key accessories are lights from Knog (they're USB rechargeable) and a Nutcase helmet. Oh! And my Boden wedge shoes are fabulous — they have great traction for pedaling. If you could change anything about biking in Boston, what would it be? Boston has made amazing strides even in the last five years. There are more bikers on my morning commute than ever before and I think this is a testament to the effort the city has made to make it safer and easier for people to ride their bikes. However, there are always improvements that will make it better. Martine Powers' recent article in the Globe paints a great picture of what it's like in Bike Heaven, a.k.a. the Netherlands. There are many things we need to do to get there, like better infrastructure and universal bike education, but it's comforting to know that even the Netherlands used to be just like Boston is today. What comes after Kickstarter & Buca Boot? Additional customization? Other bike accessories? Something completely different? All of the above? Buca Boot is just one idea that weds beauty and purpose in bike accessories. There are so many options we have within the basic Buca Boot idea: Color customization, more sizes, new attachment methods, the list goes on. My brother wants a tailgating grill built in! But it's more than just the Buca Boot. As I said, biking is a growing transportation solution and I'd love to keep designing ways to bring form and function to the growing urban biking community. First though, it's just about getting Buca Boot off the ground. Maybe after the Kickstarter I'll be able to catch my breath and think about what's next. Anything else our DIY readers should know? The Buca Boot is my baby! I've been nurturing this idea for so long it's amazing to see it so close to reality. Kickstarter is a great platform to help get us the rest of the way there but until the campaign is successful I think I'll be permanently stuck somewhere between awe and anxiety. Thanks, Kathryn! You have until Wednesday, October 23 to help fund Buca Boot on Kickstarter.